We’d love your help. Let us know what’s wrong with this preview of The Accidental President by A.J. Baime. The dramatic, pulse-pounding story of Harry Truman’s first four months in office, when this unlikely, small-town Washington outsider had to take on Germany, Japan, Stalin, and the atomic bomb, with the fate of the world hanging in the balance. Heroes are often defined as ordinary characters who get thrust into extraordinary circumstances, and through courage and a dash of l The dramatic, pulse-pounding story of Harry Truman’s first four months in office, when this unlikely, small-town Washington outsider had to take on Germany, Japan, Stalin, and the atomic bomb, with the fate of the world hanging in the balance. To ask other readers questions about The Accidental President, please sign up. I have read many biographies about Harry S. Truman (1884-1972). In this book A. J. Baime narrows the scope of the book to the first four months of the presidency. The author does provide some early history of Truman so the reader understands how events came about. On April 12, 1945, Eleanor Roosevelt summoned Truman to the White House to inform him of the death of FDR. Truman said his worst nightmare immediately became a reality. He had only been Vice President for three months and had not been i I have read many biographies about Harry S. Truman (1884-1972). In this book A. J. Baime narrows the scope of the book to the first four months of the presidency. The author does provide some early history of Truman so the reader understands how events came about. 3. Learned about the Manhattan project. Had to decide about using the bomb on Japan. 5. The devastation of Europe and the starving refugees. He sent President Hoover to Europe to deal with the logistics of feeding the people. He and General Marshall developed the Marshall Plan to deal with Europe. 6. Russia posed challenges and different goals. Stalin failed to honor any of his agreements he made with Churchill and Roosevelt about Eastern Europe. Russia developed the atomic bomb and the cold war began. The book is well-written and meticulously researched. Baime is a journalist and the book is written in that style. Baime detailed a chronology as to how Truman transformed into a president and leader of the world. Baime makes history come alive and makes an enjoyable read. The book is well organized. Truman faced many difficult situations over his presidency that had great effect upon the world and the United States. In fact, Baime claims no other president in the history of the United States has faced such difficulties at the beginning of their presidency. I read this as an audiobook downloaded from Audible. Tony Messano does a good job narrating the book. Messano is a voice-over artist and audiobook narrator. This is my first experience with listening to Messano. I met former President Harry S. Truman when he spent several days at my college. If you wanted to chat you could just walk up to him. The best time was early in the morning when he took his “daily constitutional” walk. Walking along with him was a great way to get to know how “down to earth” he was, and how much he valued every person. Some of that comes through strongly in Baime’s book, which has as its primary focus the four months after Truman is thrust into the job by the death of Franklin De I met former President Harry S. Truman when he spent several days at my college. If you wanted to chat you could just walk up to him. The best time was early in the morning when he took his “daily constitutional” walk. Walking along with him was a great way to get to know how “down to earth” he was, and how much he valued every person. Some of that comes through strongly in Baime’s book, which has as its primary focus the four months after Truman is thrust into the job by the death of Franklin Delano Roosevelt. It would have been a whole lot easier if FDR had taken any steps to prepare Truman for that possibility. Aside from sending him a congratulatory note on election night he did almost nothing. I have read some excellent biographies of Truman. Among them are Merle Miller’s Plain Speaking and Truman by David McCullough. I believe it was McCullough that quoted Harry’s cousin as noting that he was 'always' a late bloomer. He didn't marry until he was 35...so, why should it surprise for him to first arrive in Washington in his early 50's? Yet his description of the campaign is entertaining: "The candidate’s appeal was his everyman persona. He was your neighbor, or the guy standing on line at the pharmacy, who just happened to be running for VP. Truman was “one of the most amazing stories in American democracy,” wrote one Boston Globe reporter. “It is the story of an average man, swept to dizzy heights against his will, a little bewildered by it all and doubting whether it is really true.” His message was a simple one: Now, in the climactic moments of the world war, was not the time to change chief executives." And he notes the seemingly missed irony in one of his campaign speeches when he wanted to contrast the Republican, Dewey, with Roosevelt. "In early November the train pulled into Kansas City. In front of his hometown crowd, Truman delivered the most ironic sentence of his life: “Ask yourself if you want a man with no experience to sit at the peace table with Churchill, Stalin, and Chiang Kai-shek." I guess nobody thought Harry was describing himself. His first response was "No." Truman did not want the position of President Franklin D. Roosevelt's new Vice President. But FDR commanded it, and Harry S. Truman had to agree. FDR was not a well man when he took office for a fourth term. And when he died on April 12, 1945, Truman said, "the whole weight of the moon and stars fell on me." "Who the hell is Harry Truman?" 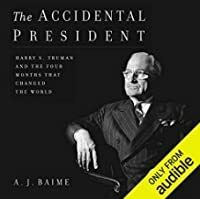 The Accidental President by A. J. Baime focuses on Truman's first four months in the presidency, portraying Truman as an unknown 'Everyman' kept out of FDR's loop, but who quickly gained the nation's trust and approval while tackling huge challenges. He came into the job with only a layman's knowledge of international politics but scrambled to catch up. Monumental decisions awaited. Baime offers a condensed biography and profile of Truman and a detailed recreation of his first four months in the presidency. It is daunting to consider what this failed businessman with a high school degree had to contend with! His straight talking, systematic thinking, and unpretentious style was refreshing and his staff was surprised, and appreciative, of his competence. When Truman took office, the U.S. Army was fifty-seven miles from Berlin. General Dwight Eisenhower had discovered the horrors of Nazi death camps. General LeMay was ruthlessly firebombing Japan, while Japan was sending out mass suicide missions of Kamikaze pilots. Iwo Jima was captured but a third of the American landing force had died. The Soviets had suffered huge losses battling the Nazis. They wanted payback. Liberating Poland and Austria, they installed puppet regimes. Prime Minister Winston Churchill wrote, "An iron curtain is drawn down upon their front." What to do with Germany had to be decided. Already the Soviets were plundering, hauling away everything they could. If the Soviets joined in war against Japan, they would want a part of Japan, too. Truman could not allow a Soviet presence in Japan. All of Central Europe's infrastructure had collapsed. Seven million persons were displaced without food or coal for heating. Children suffered from malnutrition. Yugoslavia wanted a piece of Italy. Chaing Kai-shek and Mao Tse-tung had divided China. The United Nations was yet to be organized, it's future unknown. Would the U.S. recognize the new state of Israel? The American wartime economy was thriving, but what would happen when the war contracts ended and servicemen returned home? Churchill, who would soon lose his position as Prime Minister, Truman, and Stalin gathered at Potsdam. Truman need all his poker skills when facing off with Stalin. In his pocket was the upcoming test of the most terrible weapon ever known. If used against Japan, would it mean the end of civilization? Reading about this tumultuous time was exciting and disconcerting. The whole world I grew up in was determined during these first months of 1945. In his notes, Bamie states that history is a kind of myth that morphs through time as new evidence is unearthed and interpretations arise. The author spent three years sifting through original sources, diaries, and documents, ferreting out "new accession" including oral histories. I enjoyed this highly readable and informative study. I received a free ebook from the publisher through NetGalley in exchange for a fair an unbiased review. This is a popularized history book about Harry Truman and the tumultuous first four months of his presidency. There was a lot more about Truman's history than I expected, stopping in its tracks the story of the first four months, but the background was helpful to get a measure of the man. Truman, a self-educated man who grew up in poverty, had some redeeming characteristics, such as his work ethic and his respect for knowledge and fact: “There is no substitute for a fact. When the facts are know This is a popularized history book about Harry Truman and the tumultuous first four months of his presidency. There was a lot more about Truman's history than I expected, stopping in its tracks the story of the first four months, but the background was helpful to get a measure of the man. He was also a white supremacist, with an all-out racist, Confederate-loving mother who was like Granny Clampet to the nth degree, two points treated too lightly in the book. The author admires Truman too much to be objective on other issues too, presenting in the end an uncritical elegy to Truman. I grew skeptical of the book when I started noticing factual errors, for example Alonzo Fields was from Indiana not Missouri, John Adams was the first president to live in the White House not George Washington. I'm not a historian, so the few errors I noticed made me think that there might be a whole lot more. The book is gossipy, readable, uncritical, full of trivia and snapshots of fascinating characters from history, but not as authoritative as I'd hoped. I received a review copy; this is my honest review. Harry Truman was sworn in as the 33rd U.S. President on April 12, 1945 following the death of President Franklin D. Roosevelt. The first 1/3 of the book provides a background while the final 2/3 captures Truman’s first four months in office most notably as Commander-in-Chief during the final stages of World War II. When Truman took office the stage was already set for rapid historical events to unfold, but certain decisions still had to be made. The fall of Germany, the Postsdam Conference and t Harry Truman was sworn in as the 33rd U.S. President on April 12, 1945 following the death of President Franklin D. Roosevelt. 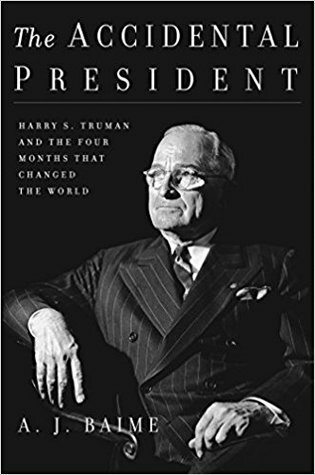 The first 1/3 of the book provides a background while the final 2/3 captures Truman’s first four months in office most notably as Commander-in-Chief during the final stages of World War II. When Truman took office the stage was already set for rapid historical events to unfold, but certain decisions still had to be made. The fall of Germany, the Postsdam Conference and the climactic mission of Enola Gay dropping Little Boy serve as a backdrop to Truman’s daily inner thoughts. Author A. J. Baime shows the strengths and weaknesses within the president who shunned the limelight. On a side note, in 2011 actor/screenwriter Ed Nelson and his lovely wife visited our home a few times. As a voting member of the Academy Awards he had visions for my WWI biography to be on the “Big Screen” and he would do the screenwriting. Ed was most famous for playing Dr. Michael Rossi on the TV series Peyton Place however for a few years in the mid-70’s he filled in for James Whitmore playing President Truman on stage, on the National Tour of "Give 'Em Hell, Harry". During his first visit Ed stood in our living room and performed a few segments as Truman! Thank you to the publishers for providing an ARC of this book through NetGalley. This was a brilliant biography of Truman, concerning the first four months of his presidency. It briefly covers a few months prior to Roosevelt’s death, so we understand how Truman came to make the decisions he did, and goes into depth concerning the war with Germany and the war with Japan, the Manhattan Project, the formation of the United Nations, Europe’s struggle to feed its peoples and refugees and the burgeonin Thank you to the publishers for providing an ARC of this book through NetGalley. This was a brilliant biography of Truman, concerning the first four months of his presidency. It briefly covers a few months prior to Roosevelt’s death, so we understand how Truman came to make the decisions he did, and goes into depth concerning the war with Germany and the war with Japan, the Manhattan Project, the formation of the United Nations, Europe’s struggle to feed its peoples and refugees and the burgeoning problem of Russia. Considering who is president as I write this, it's a bit depressing, but that's not the author's fault! It was not until April 25, 1945 (or page 167 of A.J. Baime's "The Accidental President"), that newly inaugurated president Harry Truman was told about the US development of the atomic bomb. That was nearly two weeks after Truman succeeded Franklin Roosevelt, who had died on April 12th. (I'm not exactly sure, but I think the Soviets may have known about the bomb before Truman did because of the spying done at Los Alamos.) Why hadn't Truman, who had been Vice-President since January 20, 1945, been It was not until April 25, 1945 (or page 167 of A.J. Baime's "The Accidental President"), that newly inaugurated president Harry Truman was told about the US development of the atomic bomb. That was nearly two weeks after Truman succeeded Franklin Roosevelt, who had died on April 12th. (I'm not exactly sure, but I think the Soviets may have known about the bomb before Truman did because of the spying done at Los Alamos.) Why hadn't Truman, who had been Vice-President since January 20, 1945, been let into the loop? A.J. Baime covers this and lots more in his book, "The Accidental President: Harry S. Truman and the Four Months That Changed the World". It's a book that concentrates on a short time in history, but gives the reader the full story of how that period of time relates to the periods that came before and after. He writes a short bio of Truman and his family before moving into his nomination as Vice-President (the voting was actually done on the floor of the Democratic convention, different from today when the Presidential candidate selects his running mate and a perfunctory floor vote is taken). Truman was considered a dark horse and underestimated by those who didn't know him - like Franklin Roosevelt - but he was much respected by his peers in the Senate. His formation in 1941 of the Senate Special Committee to Investigate the National Defense Program boosted his national profile a bit, but he was still an unknown quantity by the American public, shocked and saddened after Roosevelt's sudden death. Baime covers the Allied meeting at Potsdam, the decision to drop the two atomic bombs, and the early formation of the United Nations, among other topics. But most of all, Baime examines Harry Truman, the man and the statesman and how the challenges of his "accidental presidency" were met and exceeded. Harry S Truman has been one of the most forgotten presidents of the 20th Century. Standing in the shadow of FDR, it's easy to see why. But my cynicism of FDR is well founded, especially when in his 4th term the events of his hapless arrogance threw this nobody from Independence, MO. into what under his leadership became the most powerful position in the wold. To think that it was Truman who led America into the position as the greatest superpower the world has ever seen should be something to consider. Many say that FDR got us through the war; but I think it was the media that did, whose agenda FDR carefully adhered to. It was Truman as a senator who really prepared America for entry into a war where their participation dealt the final blow to the Axis powers. The investigations that Truman launched revealed staggering corruption and theft. We begin to see that FDR was not a man who could make tough unpopular choices but rather followed his political nose. The trouble with the Soviets was Truman's first confrontation over a lackadaisical former presidency that let Stalin trample agreements which would cost millions blood and treasure. Truman's confrontation with Molotov was classic (no spoilers) and my already growing admiration for Truman went sky high. The later decisions that Truman had to make based on just a few weeks of briefings reveal a man able to assimilate complex international situations and distill their most important elements while rapidly making critical decisions. I was amazed at how sound his judgement was. And the press loved him (mostly). His straight shooting, no nonsense, everyman way was a welcome breath of fresh air. His ability to answer questions immediately and clearly outstripped anything FDR was capable of, and everyone knew it. The bulk of the book is spent covering the deteriorating relationship between the US and USSR. It is totally obvious to us today that Stalin's spies had infiltrated the US in areas we're still finding out about, but most important was our top secret military research. The race for the atomic bomb became more important than winning the war against Japan since it was obvious that the USSR was nearing the end of their A-bomb development. We also were completely aware that a thug like Stalin would not hesitate to use it without discretion. That was where a Truman presidency, accidental or not, was what kept the US on the right side of history. Truman's home life is lightly covered since Bess was very shy of any attention. One gains an immediate sympathy for a woman whose modesty was assaulted by an ever growing public curiosity. This surprisingly good book was published only last year (October 2017). Harry Truman served as a Democrat president for 7 years. But the context of this book focuses only on the first four months of his presidency, until Japan's surrender during WWII. Truman was a southerner from Kansas City, Missouri. In 1945 he was the vice president of America's arguably the most admired president, Franklin D. Roosevelt (FDR). Till today, FDR is remembered by many Americans for the current US social security This surprisingly good book was published only last year (October 2017). Harry Truman served as a Democrat president for 7 years. But the context of this book focuses only on the first four months of his presidency, until Japan's surrender during WWII. Truman was a southerner from Kansas City, Missouri. In 1945 he was the vice president of America's arguably the most admired president, Franklin D. Roosevelt (FDR). Till today, FDR is remembered by many Americans for the current US social security system. FDR was elected as the president of the USA for an astounding four times, he was in the Whitehouse for twelve years. FDR died on April 12, 1945, due to a health problem. This was the occasion when the unknown Truman become the president, the accidental president of the USA during the most critical point of modern world history. Even before the death of FDR, the fate of WWII was almost certain, and the looming shadow of the cold war unwinding itself. The ingenuity of Truman during his first four months tenure was how decisively he executed FDR's plan. What is the United Nation good for? Many scholars view the UN as a gigantic dysfunctional international institute. This accusation indeed has some valid ground. The UN frequently fails in extinguishing armed conflicts, wars, ethnic cleansing across the globe. In most case, it played a role of a massive humanitarian relief organisation. So, what significant achievement this enormous institute has in its deposal? We all know the answer, but sometimes it is not so apparent. The most significant thing that The UN has accomplished is that it prevented the WWIII. You can bet on this, as long as the UN exist there will be no WWIII. Even before the end of the WWII, when Martial Stalin started engulfing Balkan states under USSR and imposing puppet regimes, some of the high officials in US government warned about upcoming armed confrontation, potential with nuclear weapons with Soviets. But, thanks to the UN, an emerging nuclear armageddon seems defused as a cold war. Many argue that the veto power of the permanent security members is undemocratic. Interestingly this undemocratic practice was proposed by Soviet diplomat Molotov. Did Japan deserve atomic bomb? In 2018 Russian world cup football, Japan won the fair play rule and went into the quarterfinal. Japan was defeated by Belgium, but the Japanese team won the heart and mind of football enthusiast all over the world. Such an attitude only reflects the hight of the enlightenment of the Japanese nation. Historically, the Japanese are a disciplined nation. But the "discipline" and the "civility" are conceptually different things. The horror committed by the Japanese during the WWII would easily outdo the Nazi. Japanese atrocity during that period was incomprehensible by any human standard. It was the Japan who drag the USA into the war by raiding Pearl Harbour, Hawaii. Technically, the Pacific theatre was fought between the USA and Japan only. The battle of Okinawa is known to be the deadliest in the history of WW2. Japanese fought like savages. While Berlin fall in May-June 1945, the Japanese were still fighting like fanatics. While the US airforce pounding tons of napalm on Tokyo and other Japanese cities, incinerating thousands of civilian and military establishment, instead of surrendering, Japanese become suicidal, they started swarms of suicide airstrike on the US Pacific fleet. The US was planning for a ground invasion on Japan by November 1, 1945. An expert in Japan warned the planning committee that the Japanese hold their empire and country as God and Holyland respectively, if the Allied force enters the mainland, the Janapness will fight with religious zeal till their last man stands. They estimated death of half a million allied troops in this DJ-day, the proposed Japan D-day. The USA allowed the Japanese Hitler, the empire Hirohito to stay in the monarch. This is because, even after digesting two nuclear bombs, the Japanese denied to surrender unconditionally. Instead, they proposed to surrender unconditionally while Hirohito stays as their empire. In one sense it is like accepting Nazi's unconditional surrender while Hilter stays alive as German leader. The USA could have brought Japanese into their knees, treating empire Hirohito like Hitler, but that would require dropping third, or fourth, or even more atomic bombs on Japan. When Harry Truman became president upon the death of FDR, he was stepping into the shoes of the most revered politician of the 20th century. Roosevelt was deeply loved by most Americans and had been president so long that many of the soldiers fighting in Europe and the Pacific couldn't remember a time when any one else was president. Truman, on the other hand, was a relative nobody. He was a fairly obscure Missourian who was picked to be vice president mainly because nobody hated him enough to o When Harry Truman became president upon the death of FDR, he was stepping into the shoes of the most revered politician of the 20th century. Roosevelt was deeply loved by most Americans and had been president so long that many of the soldiers fighting in Europe and the Pacific couldn't remember a time when any one else was president. Truman, on the other hand, was a relative nobody. He was a fairly obscure Missourian who was picked to be vice president mainly because nobody hated him enough to object to his nomination. And yet, in his first four months in office this nobody would be faced with huge events and daunting problems. These included the fall of Germany, the Potsdam conference, the growing chill in relations with the Russians, the formation of the UN, and, of course, the decision to use the atomic bomb (a weapon he had not even known was being developed until he became president). Truman didn't have FDR's self assurance and charisma, but he was as honest, hard working, decisive, and decent a president as this country has ever had, and he used his virtues to provide solid leadership through all this turbulence. I thoroughly enjoyed this book. It’s a readable account of the initial several months of the Truman presidency, from April 1945 through to the Japanese surrender in September 1945. It’s scholarly without being stuffy. The first chapter details President Roosevelt’s failing health and his last day alive, April 12, 1945. Truman is promptly brought to the White House where Eleanor Roosevelt tells him of FDR’s death. Shortly thereafter he is sworn in as president. The next chapter is the obligatory m I thoroughly enjoyed this book. It’s a readable account of the initial several months of the Truman presidency, from April 1945 through to the Japanese surrender in September 1945. It’s scholarly without being stuffy. The first chapter details President Roosevelt’s failing health and his last day alive, April 12, 1945. Truman is promptly brought to the White House where Eleanor Roosevelt tells him of FDR’s death. Shortly thereafter he is sworn in as president. The next chapter is the obligatory mini-biography which recounts Truman’s early life and how he came to be Vice-President in the 1944 election. He was never part of FDR’s inner circle and was essentially ignored by FDR after he assumed the vice-presidency. He was blissfully ignorant of what was going on when he took on the presidency. He faced a steep learning curve – it was almost perpendicular—but he quickly found his footing. One needs to really give him a lot of credit. After the book’s introductory chapters, readers follow Truman’s progress as he learns the challenges of the job and the problems facing the nation (and the world). The author tells the story in a straightforward way, chronologically, month-by-month. The major events include the closure of the war in Europe, the Potsdam Conference, the machinations over ending war with Japan and most importantly, the development of the atomic bomb. The author relies on original sources such as letters, minutes from meetings, official reports and so on to advance the story (there’s extensive end notes citing his sources). Highly recommended for students of US history and geopolitics. I receive a copy of the book through Netgalley in exchange for an objective review. I like Harry. This is a great story focusing primarily on the four months between his ascendency to the presidency and the end of the war. His earlier life is covered, though, with particular attention to his brief tenure as vice president. He knew when he met with the obviously ailing FDR that he would not remain the vice president for long. Truman had his work cut out for him taking over the Presidency in 1945...he was more than up to the task. The sort of "every man" President we won't see again. I enjoyed Baime's look at an eventful four months. Technically this is the story of the first four months of the presidency of harry Truman. It goes from the day he became president when FDR died on April 12, 1945 until August 12, 1945 just after the atomic bombing of Hiroshima and Nagasaki that ended the war against Japan. I actually think the best chapter of the book is the apologue the last chapter. Of course the book does cover more of the Truman biography than just those four months. But the claim of the books is that those four months riva Technically this is the story of the first four months of the presidency of harry Truman. It goes from the day he became president when FDR died on April 12, 1945 until August 12, 1945 just after the atomic bombing of Hiroshima and Nagasaki that ended the war against Japan. I actually think the best chapter of the book is the apologue the last chapter. Of course the book does cover more of the Truman biography than just those four months. But the claim of the books is that those four months rivaled in significance the four months of any president in history. I enjoyed listening to the book predominately because I did not really know that much about Harry Truman. But I don’t think the book did a very good job of explaining how he got to be the president who he was. He is described as fairly liberal. He only had a high school education and other than a few references to a significant amount of reading, the book does not manage to explain to me how he developed the skills that are required of a president. He was a two term senator so had some political experience. And he was a judge. He served almost 2 full terms as president. But he was apparently pretty much left out of the picture in his short experience as vice president to FDR. This period of time was dominated by the conclusion of World War II and the meetings of the allies in Berlin at the end of the European war. How Truman took the lead in that process is hard to understand as he joined Stalin and Churchill. I was of course very interested in hearing about the process of deciding to drop the atomic bomb‘s and Japan. It was more or less presented that just about everybody favored using the bomb once it was developed. It was seen as relatively noncontroversial at the time. I was sorry that there was no real consideration of any debate about dropping the second bomb. Years ago a workshop facilitator asked the group I was in: "Who was president when you were born?" I like most of the people in the class had no idea. The thought had never occurred to me. When I discovered it was Harry S. Truman, I began to read books, eight in all, about him including the comprehensive Truman by David McCullough. I have even read the boring Meeting at Potsdam by Charles Mee. I was not expecting to learn anything new about Truman and was surprised when I did. The Accidental Pres Years ago a workshop facilitator asked the group I was in: "Who was president when you were born?" I like most of the people in the class had no idea. The thought had never occurred to me. When I discovered it was Harry S. Truman, I began to read books, eight in all, about him including the comprehensive Truman by David McCullough. I have even read the boring Meeting at Potsdam by Charles Mee. I was not expecting to learn anything new about Truman and was surprised when I did. The Accidental President is a surprisingly exciting book to read. Baime takes the reader through the first four months of Truman's presidency. He faced challenges that few, if any, presidents have faced upon taking office. The U.S. was fighting a war on two fronts in Europe and in Asia. He was thrown into negotiations with two savvy politicians, Churchill and Stalin, over the fate of Europe. He learned about the development of the atomic bomb and had to make a decision about whether to drop the bomb or not. People often say that Truman was unprepared to be President. He had only been in the Senate for two terms. Truman was never in Roosevelt's inner circle and Roosevelt kept him in the dark after he was Vice-President. He became President with little knowledge of what was transpiring in the international arena. Yet, Truman was prepared in several ways. He was a student of history and what other leaders had done in difficult situations. He was a decision-maker and did not hesitate to make the difficult decisions. He had a natural instinct for politics. He also had a strong moral character, yet knew when to. Baime opens the book by taking us through the day when Roosevelt died and Truman stepped into his shoes. He follows this up with a section that shares to story of who Truman was and where he came from. Even in this section, I learned somethings about Truman I was unaware of. Baime then proceeds to walk us through the riveting first four months of Truman's presidency and the challenges he faced. I highly recommend this book to anyone in business who finds himself in the midst of a crisis. I also recommend the book to anyone interested in politics, history and the presidency. A few years back I tried reading about harry S. Truman from a well known author and ended up leaving the book on page 30 after a zillion references that made keeping the flow of the history almost impossible. Then came this book. An overview of Truman's life and how he got to be the President that dropped the atomic bomb on the Japanese Empire. A look at the humble man, the lucky politician and the savvy President who understood the World way better than anyone expected including himself. Covers the critical months from the time of FDR's Death in April of 1945 through Potsdam and the decision to drop the atomic bomb on Hiroshima and Nagasaki. Covers in a personal way Truman's role in this Critical time at the end of WWII and the beginning of Cold War and Nuclear age. Very personal history showing the personality and character of Truman. A super quick read, but chock-full of details that focus on the first four months of Truman's presidency. I loved David McCullough's definitive biography on Truman, but this book was outstanding. Well written, engaging. Wonderful! Excellent. Absolutely first rate, perhaps the best book I've read so far this year. High stakes political drama and war-time events unfold at breakneck pace. The research and writing are superb. You get to know Truman and feel as if you are right there with him during what were arguably the most challenging and momentous first four months any president has ever faced. For any readers who appreciate history and/or political thrillers, this book is for you. Very engaging look at President Truman, though sometimes presented without as much nuance as one would hope. Despite billing itself as focusing on four months, almost 50% of the book focuses on President Truman's life before those four months, including a lengthy section about his childhood. The book gives only a glance at Truman's life prior to April 12, 1945. It touches very gently on his elected term as president, and his life after the White House. What Baime has done, remarkably, is to examine the 4 months that saw Truman assume the office upon FDR's sudden death. Through the words of Truman himself, from diaries and presidential papers, through the words of his advisers and cabinet, the members of his Senate and House, Baime portrays the events that shaped the end of WWII, an The book gives only a glance at Truman's life prior to April 12, 1945. It touches very gently on his elected term as president, and his life after the White House. What Baime has done, remarkably, is to examine the 4 months that saw Truman assume the office upon FDR's sudden death. Through the words of Truman himself, from diaries and presidential papers, through the words of his advisers and cabinet, the members of his Senate and House, Baime portrays the events that shaped the end of WWII, and the US ascendancy as nuclear superpower. We may know the story, but somehow the players get fleshed out as real people, shaped by even as they are shaping, irrevocable world events. If you appreciate history, you will find much to appreciate in a book that never seems "overly scholarly", but fills in details of a few short months that changed the world. This very readable book presents Truman as an ordinary man who is very reluctant thrust into the presidency. Through hardwork and with integrity he held his own in the climactic final months of world war II. What a pleasure to pick a book to listen to and find it to be outstanding. I knew this book would be interesting but Blaime tells a compelling story in a fast-paced way. High school educated, failed businessman, possibly machine politician Harry S Truman becomes President on FDR’s death on April 12, 1945. He then faces four of probably the most consequential months the President, Nation and World may have ever faced: VE Day, the atomic bomb, VJ Day, the Potsdam Conference (which launched the Col What a pleasure to pick a book to listen to and find it to be outstanding. I knew this book would be interesting but Blaime tells a compelling story in a fast-paced way. High school educated, failed businessman, possibly machine politician Harry S Truman becomes President on FDR’s death on April 12, 1945. He then faces four of probably the most consequential months the President, Nation and World may have ever faced: VE Day, the atomic bomb, VJ Day, the Potsdam Conference (which launched the Cold War and the Arms Race), the beginnings of converting the US economy from war to peace, and so much more. All through this Truman handles things remarkably well. Blaime gets us into Truman’s state of mind and lets the reader know about those around Truman. Really remarkable. I have no issue with how this book was written in so much as it seems to be three day old left overs. Certainly nothing new, nothing you might find via a deeper dive but just old stuff told one more time. It's certainly a fascinating time that's not the issue I have but it's that the story is being told to us one more time. It might have been more interesting if more time was spent on the decision and debate to drop the bomb. While that does get some coverage in the book it is of very short thri I have no issue with how this book was written in so much as it seems to be three day old left overs. Certainly nothing new, nothing you might find via a deeper dive but just old stuff told one more time. It's certainly a fascinating time that's not the issue I have but it's that the story is being told to us one more time. It might have been more interesting if more time was spent on the decision and debate to drop the bomb. While that does get some coverage in the book it is of very short thrift and does not come close to discussing what went in to that call. Anyway this is to light on meaning for my tastes.